Winifred Westover Hart (estranged wife of actor William S. Hart) and son, William S. Hart Jr., approx. age 4, probably 1927. Original print. There are many exciting things about this photograph. From a historical standpoint, it is the only known photograph of young Billy Hart  much less mother and son together  from this time period. Furthermore, we suspect this may be the "one and only" original print from which wire service copies were made and distributed to newspapers. When we purchased it in 2012 from a prominent coin and photograph dealer in Kansas City (Jay Parrino), this gem had been encapsulated in an airtight container by Comics Guaranty LLC (CGC), which is a sister company to Numismatic Guaranty Corp.  a major third-party grading firm that encapsulates coins in holders (aka "slabs") to preserve their condition. CGC graded this print as "Excellent," and we aren't about to crack it out of its slab. 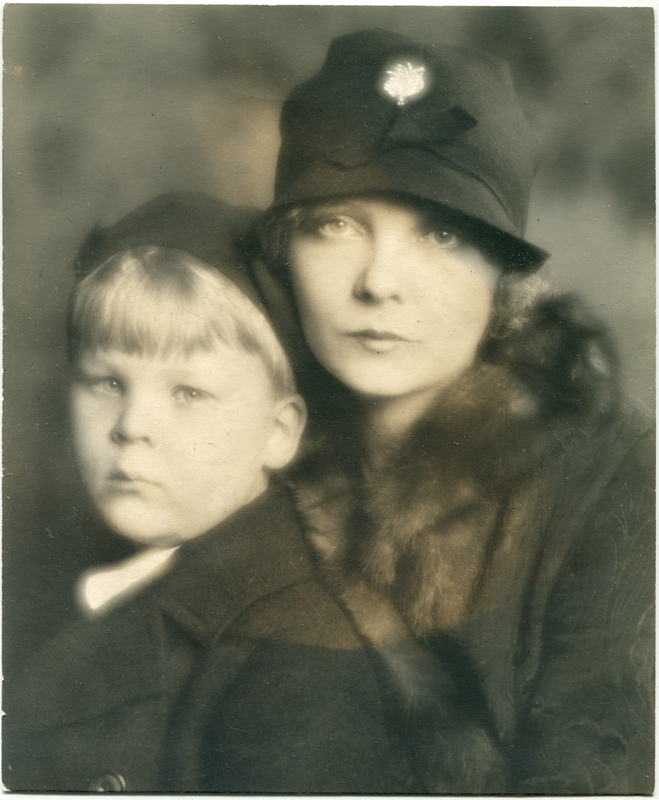 The CGC holder identifies this photograph as emanating from the Culver Pictures archive. The New York firm was founded in 1926 when it started collecting photographs and distributing copy prints  now digital copies  to publishers. Copy prints aren't graded and encapsulated  there would be no point  and CGC's holder would identify it as such. It doesn't. It's the original from the Culver Pictures archive. Visual clues set this print apart from the copies. Unlike the wire service copies, this print does not bear the International Newsreel stamp (or any other stamp) on the back. The only thing on the back is the name, "Winifred Westover Hart," in an unknown hand, and the measurement, 3¼". This we can't explain; the print measures approx. 7"x9". Unlike the wire service copies, this print is produced on double-weight stock. Wire copies are single-weight. Unlike the wire service copies, this print isn't black-and-white. It's a rich, multi-toned sepia  and the odd, circular discoloration in the center suggests it was displayed, as in a frame. Unlike the wire service copies, this print has been dismounted either from a frame or from an album, as evidenced by glue and paper/material residue on the back. Click on the image above (and click again) to see it in its original, un-Photoshopped glory. LW2288: 9600 dpi jpeg from original print purchased 2012 by Leon Worden, donated to SCV Historical Society.